Unidentified attackers torched three passenger vehicles in southern Rwanda on Saturday, killing two and injuring eight. Unidentified attackers torched three passenger vehicles in southern Rwanda on Saturday, killing two and injuring eight, the Ministry of Defence said, adding the military was pursuing the attackers who had fled into a forest. The incident comes days after President Paul Kagame said at least two Rwandan soldiers and an unknown number of rebels were killed when a group of attackers crossed into Rwanda from the Democratic Republic of Congo last week. The defence ministry said in a statement that the Saturday evening incident occurred in Cyitabi Sector of Nyamagabe District, near the border with Burundi, and the attackers had fled to nearby Nyungwe Forest. "We have been watching the situation in this area for some time now and have a good idea of who is behind today’s incident. We are in pursuit of the attackers and action will be taken against those responsible," Lt. Col Innocent Munyengango, the military spokesman, said. Gunmen on motorbikes have killed more than 40 Tuareg civilians this week in north Mali, where clashes over land and scarce water are common, an official said on Thursday.The violence compounds an already dire security situation in the desert region used by jihadist groups to launch attacks in Mali and across West Africa.The identity of the assailants was unknown, but disputes between the nomadic Tuareg and herder Fulani ethnic groups have killed several hundred and displaced thousands this year.Menaka town mayor Nanout Kotia told Reuters 43 Tuareg died in a village 20 km (12 miles) away over the past two days. "Armed men riding motorbikes attacked several nomadic campsites in Tinabaw. They shot indiscriminately at the population," Kotia told Reuters, saying security forces had been sent to the area.Mali's main Tuareg separatist group, the Coordination of Azawad Movements, said 47 Tuareg civilians were killed in the Tinabaw area. Nobody has claimed responsibility.Armed men killed 15 Fulani civilians in Mali's central Mopti region earlier this month. The military spokesman was not immediately available to give more details on Saturday's attack. Kagame had said on Friday that the group responsible for the earlier incident may have been carrying out an attack to test Rwanda's defences. While Kagame did not identify that group, rebel groups among those operating in the Democratic Republic of Congo include the Democratic Forces for the Liberation of Rwanda (FDLR). A spokesman for FDLR said they were behind the attack. Kagame left open the possibility that the attack may have been mounted by a new group called RNC, one of several other groups which he said had joined forces with FDLR. The U.S. House of Representatives Thursday overwhelmingly passed a resolution calling the crimes committed by Myanmar security forces against Rohingya Muslims a genocide. This was the right thing to do.The U.S. lawmakers deserve to be applauded for trying to turn “Never again!” into a concrete U.S. governmental policy, following the U.S. Holocaust Memorial Museum’s declaration that Myanmar is indeed committing a genocide and crimes against humanity.The House resolution states that “every government and multilateral body (in the world) should call such atrocities (against Rohingya people) by their rightful names of ‘crimes against humanity,’ ‘war crimes,’ and ‘genocide’.”It contains a call that will resonate very well with many in the rank-and-file of the Armed Forces of Myanmar unhappy with the Senior Gen. Min Aung Hlaing: it adds the commander-in-chief to the list of military commanders deemed responsible for these crimes.Despite the much-reported decline of U.S. power globally, the United States still retains unparalleled influence and reach, militarily, institutionally, economically, and ideologically, vis-à-vis Russia and China. Against this background, the unequivocal stance that U.S. lawmakers have taken against the Myanmar genocide has enormous potential to really end the unimaginable misery which 1.5 million Rohingya experience, both in refugee camps in Bangladesh and in their own places of origin within the western Myanmar state of Rakhine.However, the calls for the UN Security Council to refer the matter to the International Criminal Court or an ad hoc International Criminal Tribunal on Myanmar, or even economic sanctions alone, will have no appreciable impact on either the Myanmar military, which has institutionalized the intentional destruction of Rohingya as a target population since the 1970s, nor on the majority of the Myanmar public, who have been brainwashed to believe UN or external allegations of atrocities as “fake news” concocted by the liberal West and a Muslim conspiracy financed and coordinated by the Organization of Islamic Cooperation (OIC).That is, unless the United States is prepared to take forward the idea of military intervention in Myanmar – like the U.S. Pacific Fleet launching surgical missile-strikes from the international waters of the Bay of Bengal on the military headquarters and residences of the senior military commanders in Naypyidaw. The uses of military actions on grounds of humanitarian intervention are not unprecedented. The NATO bombing of Slobodan Milosevic’s palace and the “accidental” strike on the Embassy of China in Belgrade spring to mind.In fact, Malaysian Prime Minister Mahathir Mohamad openly suggested “going in” to end the atrocities, in a public talk at the Council on Foreign Relations in New York a few months ago.- Unrealistic optionHowever, this may not be a realistic option for a number of reasons: U.S. President Donald Trump has demonstrated absolutely no concern about the news of Myanmar troops burning Rohingya infants and elderly people alive. In fact, Trump has not even once tweeted the word “Rohingya,” let alone drawn attention to the hellish conditions they are living in. Additionally, sandwiched between India and China, which are vying for influence in Myanmar through strategic, military, and economic collaboration, Myanmar may not be an ideal place for U.S. drone or missile strikes, lest such acts draw these two Asian rivals into the military action.With respect to the impact of full and biting economic sanctions, in the unlikely event that the United States eventually imposes such severe sanctions, the four largest investors in Myanmar are China, Thailand, Singapore, and Hong Kong, followed by the U.K. The targeted pinch on the generals and the national economy will be significantly mitigated by these countries.None of these governments are likely to follow the U.S.’ lead in the current circumstances. China considers Myanmar, a country in its backyard, an integral piece of its One Belt, One Road grand project whereby it is striving to recreate the New World Order with Beijing as its imperial center. Any talk of persuading China, or Russia, with deep military-to-military ties with Myanmar, to support any punitive measures within the existing global justice and governance mechanisms, including the UN Security Council, is nothing short of delusional.The rest of Myanmar’s neighbors, including even India, base their Myanmar policies on commercial interests. India is no match for China, how desperately it may try, to curb China’s sway over the Myanmar military and civilian leaderships.Desperate to find bilateral trade deals outside the EU amid Brexit, Britain is single-mindedly pursuing British commercial interests while serving as the “penholder” on Myanmar resolutions in multilateral bodies by virtue of the historical fact that it was the country’s former colonial master.In a lengthy Dec. 12 interview with the local Mizzima News Group, British Ambassador Daniel Chugg pussyfooted around the genocide and stressed his ambassadorial goal. In Chugg’s own words, “we are the fifth-largest investor ever in Myanmar, our total stock of investment here is more than $4 billion, and our trade last year was about $500 million, which was up 20 per cent from the year before. So, it's growing but it's still relatively small in global terms and so I hope those figures will improve while I am here.”No matter how powerful it may still remain, U.S. measures will come short of what is needed to end the genocide in Myanmar.- Steps to followWhether the Trump administration makes the legal determination – as the U.S. House Resolution urges – that Myanmar is in fact committing crimes of genocide, crimes against humanity, and war crimes not only against Rohingya but also against other ethnic and religious communities such as the Kachin, Shan, and Ta’ang, is less consequential than what it will concretely do if the determination is made.The painful truth typically overlooked is that no genocide has ever been committed by the perpetrating state alone, from the Nazi genocide to Bosnia to Rwanda. There are always collaborating and “bystanding” states. The real first-step towards ending the genocide in Myanmar will have to be an international conference of states which have expressed their official concerns about the nature of grave crimes that Myanmar is committing.There are 47 member states which voted on the UN Human Rights Council Resolution this fall calling for accountability for the Myanmar perpetrators of international state crimes. Although the U.S. is no longer a member of the council, considering the overwhelming concern about the genocide in Myanmar as evidenced in yesterday’s vote at the House of Representatives, the U.S. government is best placed to host such a conference in Washington.The U.S. Holocaust Memorial Museum, which has done extraordinary work in genocide monitoring and research on the situation for Rohingya, would be an ideal civil society partner to facilitate such a conference.One primary conference objective should be to forge a coalition of governments that are prepared to pool their resources, strategic influences, and even military assets to put sufficient pressure on both the Myanmar military and Aung San Suu Kyi’s impotent leadership. Without sufficient pressure, Myanmar -- that is, the civilian government and the military -- will not accept the Rohingya as full and equal citizens, nor will they provide any guarantee for the safety of the survivor communities.As a matter of fact, the Myanmar genocide resolution rightly states that “Myanmar’s civilian government, led by State Counsellor Aung San Suu Kyi and President Win Myint, has not yet taken the necessary steps to address the violence directed against the Rohingya and has failed to create the necessary conditions for returns, including by actively impeding access to northern Rakhine for UNHCR, UNDP, humanitarian organizations, and journalists.” Having aligned the government with Beijing, Aung San Suu Kyi has shown absolutely no sign that she will relent.Against this scenario, only such a counter-alliance of states broadly supported by civil society and human rights movements consisting of Rohingya survivors can put enough concrete pressure on the perpetrating regime and the genocidally racist society to allow Rohingya to live in peace on their own ancestral land of Northern Rakhine. [Maung Zarni is co-author of the “The Slow-Burning Genocide of Myanmar’s Rohingya” (Pacific Rim Law and Policy Journal, 2014) and coordinator of the Free Rohingya Coalition. ]* Opinions expressed in this article are the author’s own and do not necessarily reflect the editorial policy of Anadolu Agency. Rwanda’s president said Friday his country has faced several provocations from neighboring Burundi, indicating ties between the two small countries have hit bottom.“We have had all kinds of provocation from Burundi and we have not fallen for that. 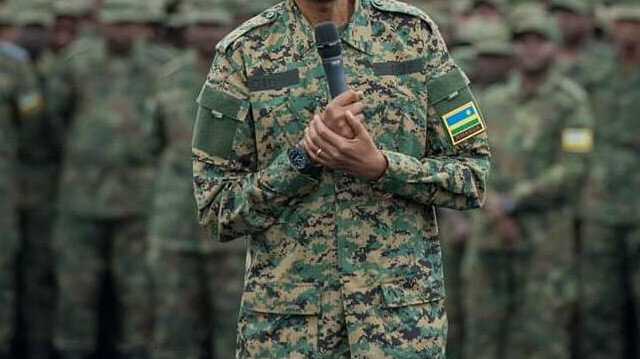 We have not been sucked into these provocations because that would be giving them what they want, to prove their point that they have no other problem except Rwanda,” Paul Kagame said in a statement posted on the presidency’s official Twitter handle.Kagame’s comments come barely two weeks after Pierre Nkurunziza, Burundi’s president, wrote a letter to the East African Community head Yoweri Museveni, president of the larger nation of Uganda, accusing Rwanda of harboring Burundian dissidents.In the letter, Burundi claimed that Rwanda supported a 2015 failed coup attempt against his government.But Rwanda denied the claims, instead accusing Burundi of harboring rebels who want to destabilize peace in the tiny nation, which experienced a genocide in 1994 that claimed an estimated 800,000 Tutsis and moderate Hutus.This week, Kagame warned that he will deal resolutely with his country’s enemies.At press time, Burundi's government had yet to respond to Kagame's statement.